Before I got serious about simplicity, I was seriously scattered. I checked my email while eating lunch and driving to appointments that I wasn’t completely prepared for. I thought I was the queen of multi-tasking. And worst of all, I was rarely fully present during conversations with people I cared about. I wanted to pay attention, but there were so many things on my mind. I was distracted. Now that I’m usually on the other side of that, I realize that this wasn’t just my problem. Between digital distractions, busy schedules, long to-do lists, and a general feeling of overwhelm, most of us struggle to pay attention. As I strive to be more present for others, I become more and more clear about what I want and need out of life, relationships, and work too. If you want to break up with your busy mind, buzzing phone, and crazy to-do lists to engage in meaningful relationships, try incorporating one of the following ideas. Agreeing to have coffee with a friend when you are on deadline for a work project won’t allow you to be fully present. Carve out time when you know you can be most present. Clear the decks and show up. Jumping from task to task or conversation to conversation doesn’t leave you room to process, so you process during the next task or conversation. To be more present, make time in between. Go for a walk, do a quiet meditation, draw or do something else to process the last thing and to get ready for the next. If you want to be present when you are working on a computer or other digital device, close the things you aren’t working on. For instance, if you show up to listen to a webinar, close your email. If you are responding to email, close Facebook. Just because your computer can accommodate unlimited sites and applications doesn’t mean that contributes to good work. Try doing one thing at a time on the computer and in other areas of your life. Disconnect to fully connect during meals or other times that are meant for human connection. Agree to put the digital devices aside. Try turning them all the way off, so you aren’t waiting for a reminder of new email, or other digital distractions. If you must stay connected for emergency purposes, let people know upfront. The first step in being present, is being you. All you. Leave everything that gets in the way of that at home. 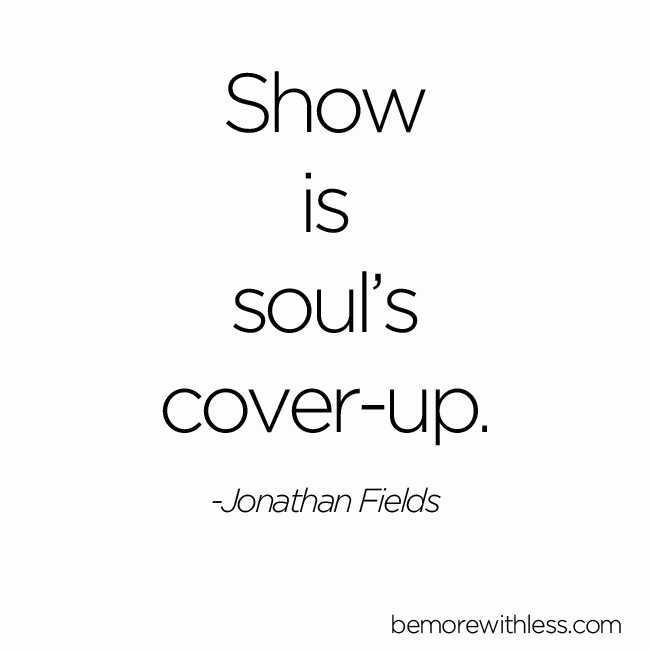 In this short article, Jonathan Fields says, “show is soul’s cover-up.” Focus on more soul and less show in what you create, what you share, and how you show up. All you. When I think an idea or thought pattern has a tight hold on me, I always discover that I am the one holding on too tightly. Write it down, let go, and be present. The best ideas will wait for you. It’s the simplest, yet most powerful technique of all. When you are overwhelmed, and feeling scattered, take a deep breath in through your nose, and let it all out through your mouth. With the breath, let out the mental chatter, the show, the overwhelm. Repeat until you are ready to be present. I still get distracted and tune out unintentionally, because I am human, but I strive to be more present and clear. I want to show up, really show up (without the show) in my personal relationships and work. Not so I can change the world, or even to fix a small problem, but just to be there for people and let them know that they matter in my life and in their life. I’ve been really loving disconnecting lately (especially from my phone) in order to be more fully present in my life and relationships. I tend to overlook a lot of amazing things when I’m distracted by technology! These are great reminders Courtney. Lately, I have been putting too much attention toward my phone and its many capabilities. I am making an effort that during meals and family time, the phone is far enough away that I am not reaching for it every few minutes. Also, I love the one at a time suggestion. It’s something I have to remind myself to do when I start to feel overwhelmed. Giving each task my devoted attention means I get it finished and typically faster than I would have if I was trying to multi-task. I love this more than I can say. Working toward a clearer mind, and heart, this all feels just right. Thank you for your posts! Thanks for this reminder, Courtney. I still need to work on this one: Make “time in between”. I know without a doubt that being present and clear enriches my life. Is is what I wish for everyone else as well. This was truly one of the best blog posts I’ve ever read. It contained exactly the clarity I’ve been searching for, what incredible timing that you posted this when I was on the verge of a breakdown. Such a simple message but so meaningful. I can’t thank you enough Courtney, I’ve been following you for years and you’ve been so influential to my life! Your tip about letting go is one that seems to work well for me too. There’s something about putting it down in writing that lets me release the fear I might forget about it. And, I do believe it opens up a channel for the Universe to communicate back to me, through intuitive hunches or other things that show up randomly, guiding me to answers or pointing me in the right direction. Great post! I use the “Pomodoro Technique”. I set a little timer and work 25 minutes on one only one task with 5 minute breaks in between. This works great for me and it prevents my mind from being to scattered. Great post with great reminders. Thank you. I’ve found that when I am scattered, it is a red flag that I need some of my own attention. First, I check to see if I am meeting my basic needs. Am I sleeping enough? Eating well? Drinking water? Taking my supplements? Then I check for emotional and sensory overwhelm. I have found mini-breaks and yoga nidra techniques to be incredibly helpful in this respect.